This category contains blog entries discussing trades Troy is considering but has not actually executed. PG is not in my ‘top 10’ watch list for Dividend Kings simply because its revenue and dividend growth rates have been slowing while other Dividend Kings have not. However, most of the stocks in my ‘top 10’ watchlist are also far above my target buy price. PG is currently substantially below my target buy price. Thus, I am taking another look at PG. To determine a target buy price for stocks to add to my long-term holdings portfolio I compute annual high/low dividend yields for the past 10 years and then average the annual high yields. Taking the current annual dividend and dividing it by the 10-year average high yield gives me a target buy price. Let’s look at how this plays out with PG. PG has a 10-year average high yield of 3.5%. With the recently announced increase in the dividend in 2018 PG will pay out a total of $2.84 per share. Thus, my target buy price for PG would be $81.14. PG closed on Friday at $73.80, a 9% discount to my target buy price. PG’s highest dividend yield in the past 10 years was 4.05% which occurred in 2015. PG’s dividend yield for 2018 is now 3.84%, thus, higher than the 10-year average but not quite as high as available at its lows in 2015. That’s what makes PG an interesting potential buy at current prices. You get a blue-chip stock with a 62 year history of annual dividend increases at a dividend yield that exceeds its 10-year average high yield. In my mind the low price/high yield makes up for the slower growth rate relative to some of its other Dividend King peers. Its dividend growth rate, while slowing over the past 3 years, still exceeds the rate of inflation. Given the downward trend in price I will likely hold off for a while longer but anything below $70/share will be very hard to resist. At $70/share the dividend yield would exceed 4%. I received a comment on my recent post entitled Building a “Dividend House”. The commentor took issue with the lack of sector diversification in the selections I had made for the foundation of a dividend growth and income (DGI) portfolio. Specifically, he took issue with what he saw as an overweighting in the Consumer Goods sector and a lack of any positions in the Information Technology (IT) and Financial sectors. The purpose of this post is to provide a rebuttal and explain why I feel diversification should not be an overriding concern in this type of portfolio. First, let us recall the objective of the “Dividend House” portfolio. The overall goal of the portfolio is to provide a safe and growing stream of income in retirement. A dividend king stock, regardless of its sector or industry has proven to be resilient in all kinds of markets and economic conditions. That is why they make great candidates for forming the foundation of a portfolio. As long as you can reasonably expect its business model to continue to be successful and its growth to exceed the rate of inflation nothing else should really matter. 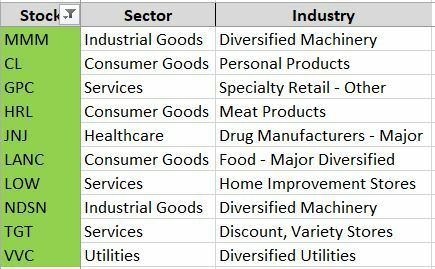 Now let us look more closely at the sectors and industries of the stocks I chose to include in the foundation portion of the “Dividend House” portfolio. As shown above the stocks selected for the foundation of the “Dividend House” portfolio, despite diversification not being an objective, are spread across 5 different sectors and 9 different industries. Why did I not select any stocks from the IT sector? Simple, there are no dividend king stocks in that sector. Why no financial stocks? Well, of the 27 stocks classified as Dividend Kings, there are only 3 in the Finance sector, two banks and one insurance company. They are Cincinnati Financial, Commerce Bancshares, and Farmer’s and Merchant’s Bank. Their 10-year annualized dividend growth rates are respectively, 2.82%, 4.35%, and 2.72%. Compare those rates to the 16.25% average dividend growth rate of the 10 selected stocks and it is easy to see why they weren’t chosen. Choosing one of them simply for the purpose of diversification would have resulted in a higher probability of mediocre returns in the future. Now, one final point with regard to my rebuttal on the lack of diversification in the foundation of the “Dividend House” portfolio. The total portfolio does not consist of just these 10 foundational stocks. Readers of my original post will recall that the “Dividend House” will also have walls, a roof, and even a garden. Perhaps the best stocks for these parts of the “Dividend House”, will include positions from the IT and Financial sectors, or perhaps not. Like the foundation, those sections will include stocks that offer the best opportunity for high, safe dividend growth. I executed a new trade today. I’ve had my eye on this one for some time now. I sold puts on C. H. Robinson Worldwide (CHRW). You’ll notice I didn’t go hog-wild with this one. By that I mean I intentionally kept this a small trade. I did so because I’ve never traded CHRW before and thus don’t have any experience in how volatile it is or an understanding of how it reacts to market and company specific news. (4) The first three reasons mean I wouldn’t mind owning it at this price and am interested in possibly establishing a longer-term position in it. (5) Given the low level of volatility in the market, I liked the potential 2% ROIC if the puts expire worthless. Here’s a one-year price chart which shows the strong support at $56. 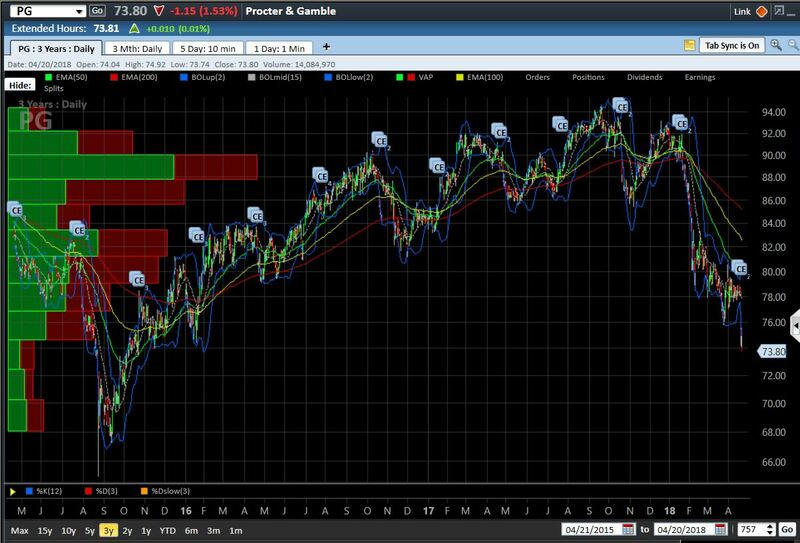 Here’s the three year chart which show just how far back the support at $56 extends. That’s it for this one. Other trades I’m currently keeping an eye on include the NUE JUL $42 puts and the CAT JUL $80 puts. Both ran away from me today but given the recent volatility I expect they’ll come back down and I’ll get another chance to pull the trigger. Yesterday I set out to write a post on four possible trades from my dividend supertars list. Unfortunately, I ran out of time and didn’t get anything posted. So, this evening I’m taking a slightly different approach. I’m going to attempt to finish a post on one of them. If I get it finished then I’ll start another post with my next selection. As you can see from the title my potential trade involves Walgreens (WAG). This is a stock I’ve been following for a couple months now. As a matter of fact I already have an open trade in WAG. Specifically, I’m short 4 FEB $30 puts. This new trade is a bit different than any others I have written about previously. It is different in that in addition to doing a rather ordinary buy/write trade I am also going to buy a protective put. A protective put allows me to buy insurance for a decline in the price of WAG. Let’s look at the specifics of the trade I’d like to execute. As I mentioned above this trade involves a buy/write. Specifically, I would like to buy 400 shares of WAG at today’s closing price of $34.28 and at the same time sell to open (STO) 4 MAR $34 Calls at $1.17. Then, I would like to buy to open (BTO) 4 MAR $31 puts at $0.21. This trade has many possible outcomes, two of which I’ve included in my spreadsheet above. First, if the calls are assigned at $34 at expiration on March 16 I will have earned $250.30 or 1.82% ROIC. Second, if the calls expire OTM and worthless I will have earned $379.20 or 2.76% ROIC. Both of these scenarios give me a return greater than my desired minimum of 12-15% per annum. My net cost (or break-even point) in this trade is $33.35. Having purchased the put at the $31 strike price means my theoretical maximum loss is $2.35/share or $940. This equates to 6.85% of my invested capital. My plan if WAG declines by March 16 would be to sell to close (STC) the puts prior to expiration and and use the proceeds to lower my cost basis. Then, I would sell another round of covered calls. The decision to purchase additional put protection would be dependent on how the overall market was acting. If you would like more information about Walgreens, I have written about it before. You can read it here: https://troysmoneytree.wordpress.com/2012/01/14/new-trade-wag/. As I mentioned at the beginning of my post I have a few other trades I am considering. These also involve executing buy/writes with a protective put. Stocks I’m interested in are AVP, BBY, and CHRW. As you know I recently announced a new strategy centered around strong, large-cap, “dividend superstar” companies. 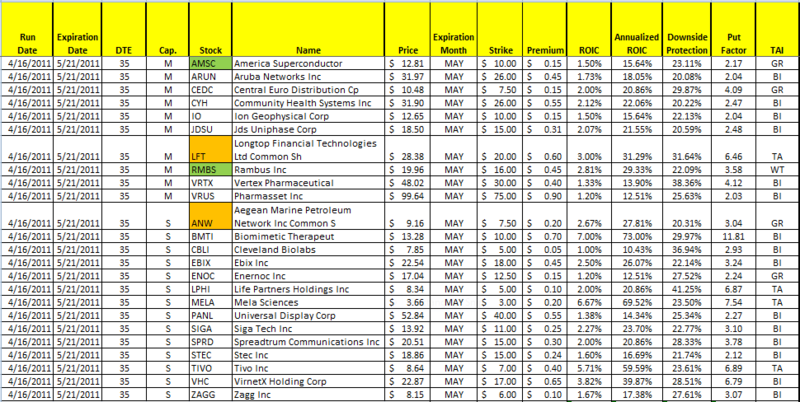 Today I want to begin a series of posts which highlight stocks from the dividend superstar list which currently appear to have trade potential. I will be selecting stocks using Ron Groenke’s VISIONS software. Specifically, I will be looking for stocks which VISIONS has rated “Take Action” (TA). This week the VISIONS scan of my dividend superstars list returned three possibilities, Best Buy (BBY), Infosys (INFY), and Tiffany (TIF). Friday, BBY closed at $25.44. It has recovered from its 52-wk low of $21.79 which it hit back in October 2011. It last reported earnings in December so it won’t report again until late March. 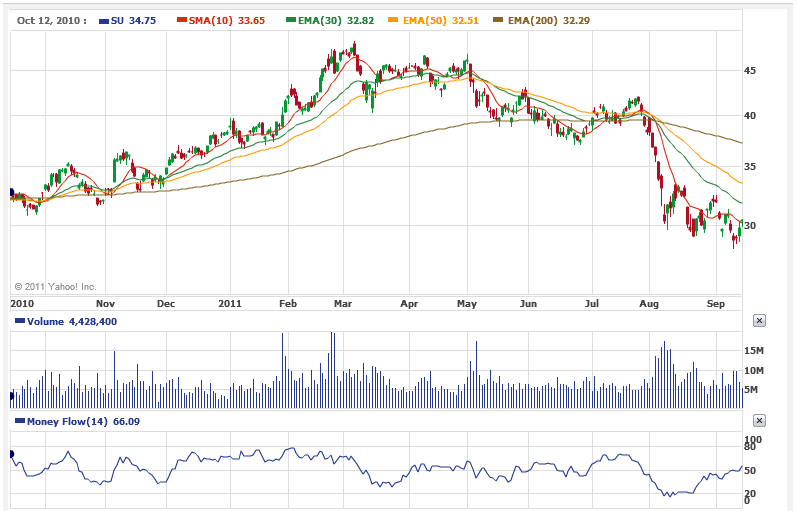 The trade which most appeals to me for BBY right now is the FEB $24 covered call. The premium is $1.66. Thus, the ROIC if assigned at expiration is 0.86%. If unassigned the ROIC is 6.53%. Next let’s look at Infosys (INFY). INFY closed Friday at $54.31. INFY has a 52-wk low of $46.12 which it hit back in September 2011. Like BBY it has already announced quarterly earnings so we don’t have to worry about that. For INFY, the best trade in my my opinion is the FEB $52.50 put. It has a premium of $0.60. This gives a ROIC of 1.14% with 3 weeks to expiration and down-side protection of 4.43%. Last, but not least is Tiffany (TIF). On Friday TIF closed at $63.49. 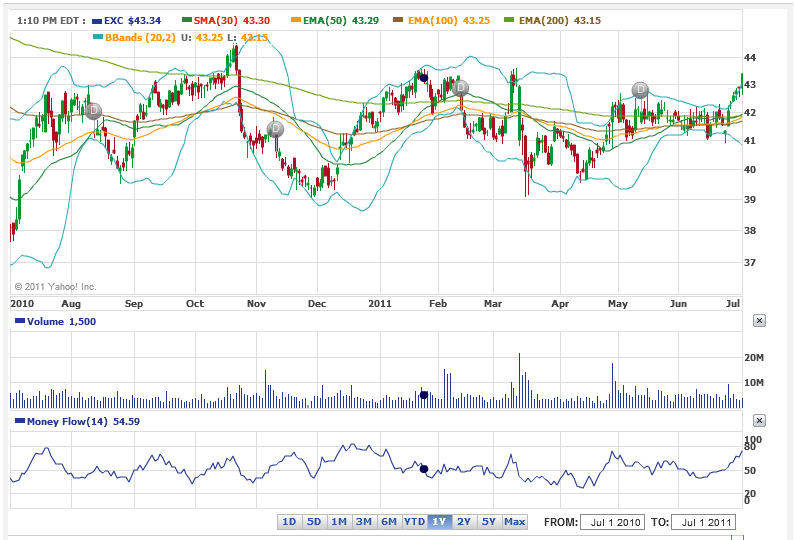 TIF has a 52-wk low of $54.58 which occurred in March 2011. Like BBY and INFY, TIF has already announced quarterly earnings. For TIF I like the FEB $60 put which is at $0.61 bid. This gives a ROIC of just over 1.00% and DSP of 6.5%. A final not before I close; there was a fourth stock which VISIONS rated TA. It is CHRW. However, I eliminated it from further consideration because it reports quarterly earnings on Tuesday, January 31. If any of these selections interest you please conduct your own due-diligence. As I mentioned in an earlier post, I am in the process of developing a new strategy for trading covered calls (CC)and naked puts (NP). Options will be selected from a limited universe of companies which have increased their dividends annually for a minimum of 10 consectutive years. The strategy will hinge on identifying companies in this list which have fallen out of favor on Wall Street and consequently are trading near 52-wk lows, or better yet, multi-year lows. I will establish a position in these ‘out of favor’ companies via the sale of NPs. After having the stock put to me I will begin collecting dividends, and will sell OTM covered calls. The objective will be to eventually sell the stock after substantial capital gains have been achieved. You may have gathered from my lack of specific criteria that I don’t have this strategy fully developed yet. You would be correct. However, I’m willing to ‘go out on a limb like this’ because of the stocks I’ll be trading in. All have been around for many, many years and thus have survived all manner of economic downturns and adverse business conditions. I have no fear that any of these companies will go out of business. Also, because I’m buying at an already discounted price the risk/reward ratio is in my favor. Now, does that mean that I don’t think any of these selections will not drop any further after I acquire them? No, certainly not! Anything is possible, especially in these volatile times. However, I am confident that I’m buying closer to the bottom than the top. And, I’m confident that if the stock does continue to head south after I buy it, it will eventually recover. So, without further ado, let me give you my first selection from this new strategy. The company is Avon Products, Inc. (AVP). AVP engages in manufacturing and marketing beauty and related products in worldwide. Its beauty products consist of color cosmetics, fragrances, skin care, and personal care; fashion products include fashion jewelry, watches, apparel, footwear, accessories; and children’s products; and home products consists of gift and decorative products, housewares, entertainment and leisure products, and nutritional products. Avon Products Inc. markets its products through direct selling and independent representatives, as well as through distributorships. The company was founded in 1886 and is based in New York, New York. So, let’s begin our due-diligence by looking at the price history of AVP. As I mentioned above one of my key criteria is to begin selling puts when the stock is at or near yearly or multi-year lows. AVP fits that criteria to a ‘T’. First, let’s look at a 1-yr price chart. Friday, AVP closed at $16.72. It’s 52-wk low is $16.09 which was hit on November 25. Now, let’s look longer term. Here’s a chart going all the way back to 2000. As you can see AVP is rapidly approaching its March 2009 lows. On March 9, 2009 it hit an intra-day low of $14.40 before closing at $15.20. Prior to March 2009 AVP hadn’t been in the $15 range since 1999. Now, as I also mentioned, each stock in my investing universe must have paid steadily increasing dividends for a minimum of 10-years. AVP fits the bill in this regard as well. AVP has increased its quarterly dividend from $0.09 in 2000 to $0.23 in 2011. As a matter of fact AVP has been steadily increasing its dividend since 1989 when it was $0.0234. That’s 22 straight years of dividend increases through all kinds of market conditions. That, coupled with the fact that the company has been in existence since 1886, gives me a lot of confidence that even if I don’t perfectly time the bottom I’ll be fine at the end of the trade. Now let’s look at a few other fundamentals before moving on to the specifics of the trade. First, let’s discuss some of the more positive metrics. (1) P/E Ratio – the trailing P/E ratio is 9.83. This compares favorably with P/E ratios encountered over the past 10 years. (2) Income – AVP is consistently profitable. I’m not saying its profit is consistently increasing. I’m saying they find a way to make a profit every year in all market conditions. They have been profitable every year for the past 10 years. (3) Dividend Payout Ratio – is currently 53%. This means there is plenty of room for further dividend growth. Now, let’s consider the negatives. (1) Debt/Equity Ratio – is 178%. This is higher than I generally like to see in a stock. However, the company generates strong cash flow so the debt load can be supported. Now before looking at specific trades let’s consider why AVP is currently out of favor on Wall Street. It primarily is because of a lack of execution. SG&A costs have far outpaced sales growth. Evidently, the board of directors finally had enough of this under-performance because they recently announced that Andrea Jung would be replaced as Chief Executive. Finding someone who can rein in costs and run a tight ship is key to AVP’s recovery. I am confident AVP can regain Wall Street’s confidence. Now, finally let’s consider some possible trades to establish a position in AVP. With a dividend rate of 5.5%, and a dividend increase announcement likely before the next ex-date on or around February 15 I am leaning towards structuring my trade such that I acquire shares at January expiration. However, given the recent market weakness I’m also concerned that AVP might have further to fall so acquiring shares now may be premature. Here are two possible trades with January expirations. (1) STO JAN $16 puts at $0.40. If the put finished ITM I would own AVP at a cost basis of $15.60 and be in position to earn the next dividend. This trade has a ROIC of 2.5% with 5.2% DSP. (2) STO JAN $15 puts at $0.15. If the put finished ITM I would own AVP at a cost basis of $14.85 and again be in position to earn the next dividend. However, this trade only has a ROIC of 1%. DSP is 9.8%. As I mentioned above, given the overall market conditions, I’m not totally convinced AVP has found a bottom and is trying to carve out a base. Thus, I am going to work my way into this position over time. I eventually would like to own 1,000 shares of AVP. So, I am going to start by entering this trade by only selling 3 option contracts. This lets me ‘have my cake and eat it too’ so to speak. I can possibly acquire some shares now at what I think is a fair price and begin collecting the ample dividend. Then, if the market continues to fall I can dollar cost average down by selling another round of puts at a lower strike price. However, if AVP does find a bottom and begins to rise I will at least have been able to acquire some shares at a great price. Well, that’s it for this post. I hope to have another one or two trades to consider in the very near future. WAG and SYK are on my radar screen. We have a total of 77 trades to consider this week for the Weekly NP Strategy. Of these 3 caught my eye, BP, SU, and ORCL. Let’s first consider BP. BP like most every other stock has bounced off of its recent lows. It closed today at $39.52 and we have the opportunity to sell the $37 strike price. I would like BP at the $36 strike much better, but the $37 isn’t bad. I think this might be worth a look. Next up is ORCL. Like BP I would be happier if we could sell the put one strike further out of the money. With ORCL we can sell the $26 put. 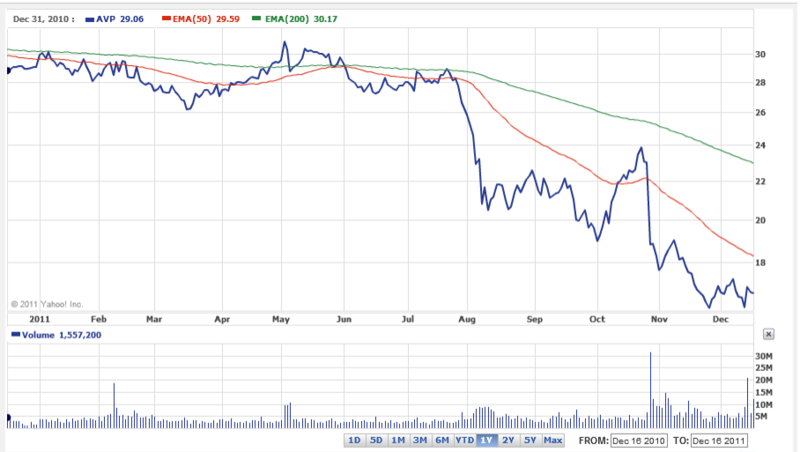 ORCL has strong support at $26 but even better support at $25. Last, but not least, we have another oil and gas company. However, this one is a foreign operator. Suncor is a Canadian oil sands company. Suncor looks good at the $28 strike. The $52-wk low is $28.12. Well, that’s it for tonight. I’ll be back later this week-end with posts discussing the end of the SEP expiration period and presenting a first look at our OCT opportunities. EXC – What’s the Plan? I have been trying to get into a rhythm with EXC for almost a year now. Just when I think I’ve got it figured out it does something unexpected. My strategy for EXC is based on my observation that the stock tends to run up immediately prior to each ex-dividend date and then sell-off for a couple weeks after the ex-dividend date (see chart below). Consequently, what I’ve been trying to do is sell calls immediately prior to the ex-dividend date and then follow-up a few weeks later after the ex-date and either sell puts after it appears to have hit bottom and/or buy back my calls. That didn’t quite work out this last time. I managed to sell JUL $43 calls near the top of the range before the ex-dividend date but didn’t sell any puts after the ex-date. The stock didn’t sell-off quite as hard as it had previously. In looking at the chart I think EXC could top out around $44 between now and the ex-date of August 11th. Unfortunately, with my JUL $43 calls being ITM I can’t wait around that long. My plan is to keep a close eye on it between now and JUL expiration. If it keeps going up and gets at or above $44 I will roll out and up to the OCT $44 calls which closed Friday at $1.00 bid. If it stalls out but stays above $43 I will roll out to the OCT $43 calls which closed at $1.45 bid. If it falls and my JUL $43 calls expire OTM I will probably wait until closer to the August ex-date before selling the next round. However, I will still be looking to sell OCT calls at either the $43 or $44 strike. Then, towards the end of August I’ll look to sell NPs. I only want to sell NPs when I can get a decent premium at the $40 or less strike price (I would like to own more EXC if I can buy it for $40 or less). Like the calls I am interested in the OCT puts because they are the closest to the next ex-date which occurs in early/mid November. Below is the list of the trades meeting our Week 5 criteria. We haven’t had a “Week 5” for quite some time so let me refamiliarize you with how this occurs and the criteria we use for the Week 5 selections. First, a “Week 5” occurs only a couple times a year. It occurs when there are literally 5 weeks between expiration dates on the options calendar. Given the extra week to expiration (hence, an additional week of exposure to market and stock risk) we increase our requisite DSP to 20%. The put factor (PF) remains the same at 2.0. As you can see we have 24 selections meeting our Week 5 criteria. I have highlighted four that I found to be interesting and worth doing some DD on. The two highlighted in green, AMSC and RMBS, are my best bets. LFT and ANW, highlighted in orange, are in my mind much riskier but also worth a look. American Superconductor (AMSC) had a precipitous fall earlier this week when its largest customer (70% of revenue) stopped taking delivery on any more AMSC product. There’s nothing wrong with AMSC’s product, it appears their customer’s business is slowing down and they have too much AMSC product in inventory. Here’s why I like this AMSC trade. (1) At a strike price of $10 you have over 23% of additional DSP on a stock that has already fallen 49% in the past week. (2) The bad news is already priced into the stock. While it could fall further, I have a hard time believing it will fall another 23% in 5 weeks. (3) The book value of the stock is $9.86. If you have the stock put to you at $10, you’ll own it at book value. (4) Almost half of the $9.86 book value is cold, hard cash in the bank; not intangible or illiquid assets. (5) After the big drop in price this week an insider stepped up to the plate and increased his holdings in AMSC by $50M. I don’t think he would do that unless he thought it was a great buy at the current price. (1) The ROIC at 2.83% is fantastic given the over 22% DSP. However, this is due to RMBS announcing earnings next week. Despite the impending earnings release I still like this trade. (2) The stock has not seen $16 since November of 2009. 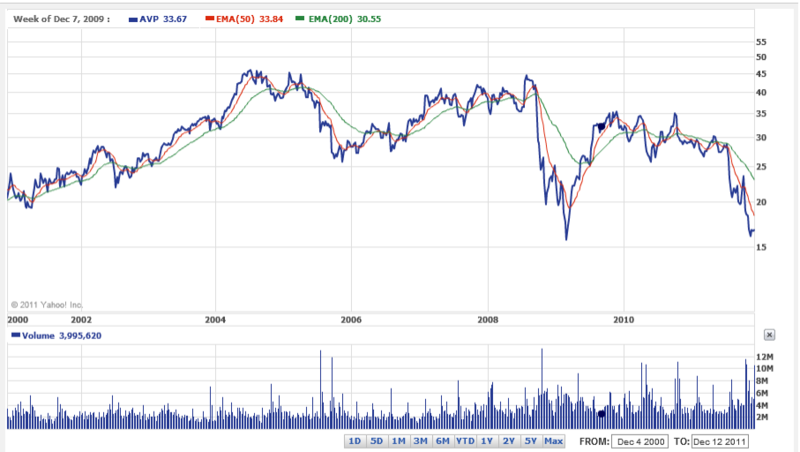 Also, it has strong support at $16 as it bounced off of this level 4 times between August and November 2009. (3) RMBS has a strong balance sheet with almost $4/share in net cash. A quick note or two about the riskier plays I mentioned. LFT is a Chinese mid-cap stock. It sells software to financial services companies. It has sold off hard due to fear of what could happen to its business should the Chinese real estate market falter. That isn’t an insignificant risk given the government’s rise in interest rates to keep inflation at bay. The other risky play is ANW. It provides marine fuel logistics services. What caught my eye about it is that it is trading at 0.8x book value. While that doesn’t mean it can’t fall further it does tell me it is more likely to tread water at this level than fall much further to the selected $7.50 strike price. Best of luck to all of you in the coming month. I made a couple of NP trades over the past couple of days that I want to update you on. One is a very conservative trade on a true blue-chipper, MSFT. The second one undoubtedly involves a substantially greater amount of risk. It is with the high-flying mid-cap networking company Riverbed Technology (RVBD). First up let’s look at my MSFT trade. Yesterday (4/12) with MSFT trading at $25.59 I decided to STO 5 MAY $24 puts at $0.26. My ROIC is 1.083% with 38 DTE and 7.15% DSP. 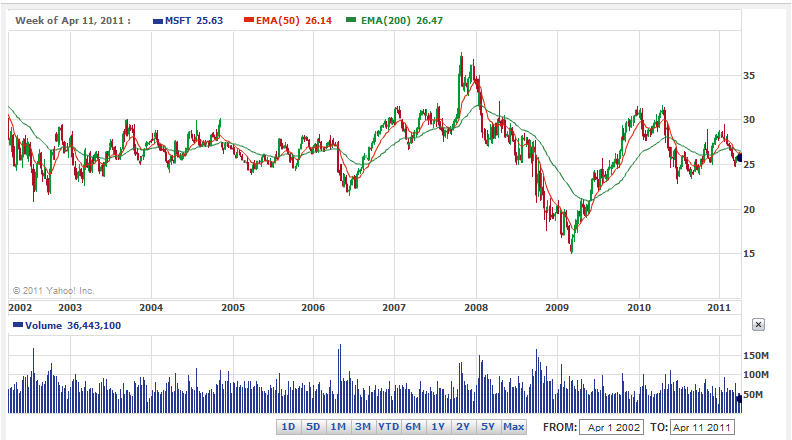 Here’s why I like this trade; look at the chart below of MSFT’s trading history for the 9 years. It has gone nowhere. It peaked in October of 2007 at $37 and fell to about $15 in March 2009. Eliminate those peaks and valleys and it essentially has been range bound between $23 – $30. With MSFT currently trading in the bottom of this band selling the MAY $24 puts seems like a pretty safe trade. My objective in this type of trade is to generate a 12-15% annualized ROIC. The strategy for achieving this objective is to sell near month puts on safe, large-cap stocks. If the puts expire OTM and the stock is still in the bottom of the range I’ll repeat the trade next month. If the puts finish ITM I will accept assignment and sell near month ATM calls against those shares. My inspiration for doing this type of trade comes from my investing buddy, friend, and mentor Teddi over at www.fullyinformed.com. Check out her recent article on how her trades in MSFT have outperformed gold over the past few years. over 16.5% DSP. The strike is below recent lows. The PF at the time of my trade was 2.0. My objective in this trade is simply to generate a generous ROIC relative to the amount of risk I believe I am taking. The strategy involved is just taking advantage of opportunities as they present themselves in the market. As I mentioned earlier this trade is not without substantial risk. RVBD has been on a tear over the past year. It had gone up almost 200% (from $15 to $45) in the past year before starting to fall back to earth a month or so ago.